GRAFENWOEHR, Germany — Neustadt an der Waldnaab, the county which oversees Grafenwoehr, Netzaberg and Eschenbach, rolls out a biodegradable recycling program this October requiring residents to separate and recycle plant-based kitchen waste. The new program is the next in a series of other county-specific biodegradable recycling policies designed to comply with Germany-wide environmental mandates. The cities of Altenstadt, Eschenbach, Etzenricht, Grafenwoehr, Kirchentumbach, Mantel, Netzaberg, Neustadt, Neustadt am Kulm, Oberwildenau, Parkstein, Pressath, Schwarzenbach, Speinshart, Steinfels, Trabitz and Vorbach are affected. Residents are now required to separate biodegradable waste, or “bio waste,” from ordinary refuse and discard it in a new brown “biotonne” bin, according to the U.S. Army Garrison Bavaria waste management program. Servicemembers, DOD civilians and families are also required to participate in accordance with the DOD’s Environmental Final Governing Standards for Germany, a document aligning U.S. military standards with German federal regulations. Residents of Neustadt County will receive Biotonne bins, pictured above, for all biodegradable waste, or “bio waste.” Collection of bio waste begins October 2017. The program officially begins Monday, Oct. 1. All Neustadt residents will receive their new individual brown 120-liter “biotonne” containers from the county’s waste management office before October, said USAG Bavaria Tower Barracks SORT Coordinator Helmut Bueller. The new brown bins have address labels and stickers that describe the program and list examples of permissible bio waste items. 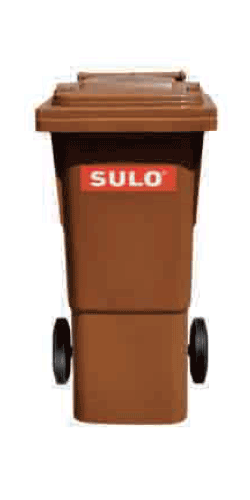 Families should refer to the label on their bin and review their community’s updated trash separation chart for more specific instruction. In general, bio waste consists of compostable or plant-based kitchen waste, such as leftover vegetables, fruit peels, coffee grinds, egg shells, grass clippings and dead flowers. Bio waste does not include meat or dairy products. Neustadt will provide bio waste pick-up will on a biweekly basis, according to new pick-up schedules. Families should roll their bio waste bin to the curb or designated pick-up location the evening before scheduled pick-up. First pick-up dates are as early as mid-October. Collections of the county’s biodegradable waste will eventually be used to produce heat and energy for the region, Bueller said. The new program is also an opportunity to help your community improve waste management and foster a healthier environment. To ensure high quality and no contamination, waste management teams will use automatic electronic detection systems before dumping the contents of each bio bin into the compost mix, Bueller said. Bins contaminated with metal and plastic will not be collected. View your community’s updated trash separation table and pick-up schedule below, or head to the Self-Help Store for a hard copy. For more about the recycling program at USAG Bavaria, visit www.bavaria.army.mil/trash. Questions? Call the USAG Bavaria SORT Coordinator at DSN 475-6664, CIV 09641-83-6664 for Tower Barracks or DSN 476-2600, CIV 09662-83-2600 for Rose Barracks.